Megan R. Sweet, Ed.D. 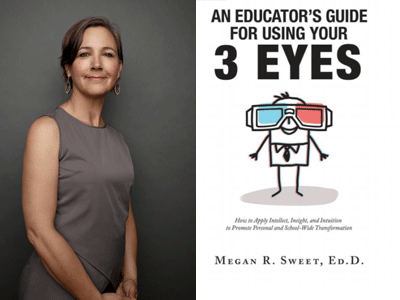 discusses her fundemental hands-on guide, An Educator's Guide to Using Your 3 Eyes: How to Apply Intellect, Insight and Intuition to Promote Personal and School-Wide Transformation. Applying intellect, insight, and intuition to promote school-wide transformation for educators through interpersonal reflection and hands-on tools. This is no one-size-fits-all approach to education that provides a formula or a practical how-to guide. The truths found in this book are about applying research-based best practices to the processes that lie outside of academia. Readers will find themselves getting out their pens and highlighters to write in the margins and apply personal reflection to the teachings. The three Is-intellect, insight, and intuition-are tools for educators to find personal growth and development inside the structure of the school system so that they can promote school-wide transformation. When educators stop fighting the system and instead look inward for the answers, they will begin to see the improved student achievement and involvement they crave. Readers will walk away with: - greater self-awareness that will improve the classroom and educational landscape around them, - improved self-appreciation that will fuel empathy in the classroom and workplace, - clarity about the origin and influence of their beliefs that will help them combat negative beliefs and take advantage of positive beliefs, and - better decision-making skills developed through a contemplative approach. By Megan R. Sweet Ed D.